Understated elegance flows effortlessly through the gentle curves of the Kasler Collection. The medium walnut finish on walnut veneers is the first break with contemporary tradition that this unexpected gem makes. Bent wood drawer-fronts accented with polished graphite grey hardware create graceful curves that carry from each case piece to the bold slope of the bed rails. 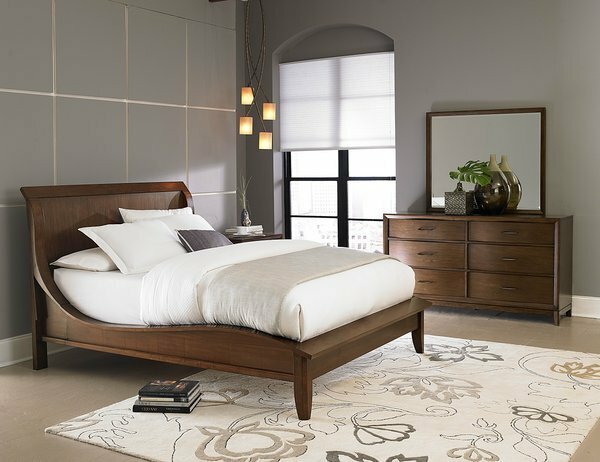 Sleigh headboard and low-profile footboard lend to the contemporary European feel of the collection.